In 2014, the world's journalists, investors and software developers all collectively discovered they'd been disastrously wrong about Apple in 2013. And with good reason. Journalist Daisuke Wakabayashi of the Wall Street Journal finally admitted that "the story line" he and his colleagues been actively promoting throughout 2013 (that Apple's "formidable growth had petered out and Samsung Electronics Co. was eating its lunch") was completely backwards, an upside down concoction of false reports that contradicted everything that was actually happening in the industry. Well, at least he passively admitted "the story line" was false. It is extremely unusual for business journalists to admit they've gotten the story wrong. Matthew Garrahan and Tim Bradshaw of the Financial Times similarly passively admitted they had fabricated a false story about Chromebooks in education, for example. There will apparently never be an actual correction. The way sites like CNET and Reuters cover Apple, one could build a career around simply pointing out how disastrously wrong and twisted their reporting is. In fact, several people could stay busy doing just that. The authors of knuckle dragging hit pieces (like the BBC's recent blaming of Apple for all social ills around the planet, even those with very little connection to Apple) will continue, but mainstream journalists have appeared to wake up to the reality that Apple is the primary innovator in consumer electronics, the only company with any real concern about workers' rights and environmental issues, and virtually the only PC and phone maker that can consistently earn sustainable profits. It's hard to not understand that when faced with the reality that Apple earns 86 percent of the handset industry's global profits, while being the only company to take any real action to improve the status quo in a sea of cutthroat penny pinching manufacturers that revolve around free software. It's not just hot air that changed its direction this year. In 2013, the collective activity of securities investors helped dump Apple's market capitalization by almost $22 billion, from $515.5 billion at the beginning of 2013 to $493.7 billion at the start of 2014. This year however, despite continued stock buybacks that have removed tens of millions of its shares from the market, Apple's stock is now valued at $669.5 billion, an increase of $175.8 billion. That means more new money flowed into Apple stock this year than is currently invested in Target, Tesla, T-Mobile, Twitter, Texas Instruments and Tupperware, together. Plus another $5.5 billion (enough to tunnel San Francisco's Silicon Valley train to the Transbay Terminal, twice). Investment not only flowed into Apple, but flowed out of a series of former industry darlings. For example, Google's market cap is down around $27 billion for 2014, and that's without any buybacks reducing the company's outstanding shares. That's not only a drop larger than Apple's great stock delusion of 2013, but is a much greater proportional change because Apple is far larger than Google (currently about $300 billion greater in its market cap). It may not be a coincidence that so many investors were betting on the wrong horses last year, just as the pinnacles of business journalism were approaching pure delusional failure. The "Haunted Empire" invented by Yukari Iwatani Kane may simply have been an enigmatic metaphor for the Wall Street Journal itself. Remember when Kane predicted in 2011 that Apple was working on a new iPhone half the size and half the price of iPhone 4? It's almost as if Kane were haunted by a ghost of irrelevance. Software developers also recognized this year that the memes of 2013--that Android was "winning," that iPads were collapsing, that 64-bit didn't matter in mobile devices and that the only thing anyone cared about was cheap hardware--were all total horseshit. Within 2014, IBM--one of the most strident supporters of Linux over the past decade--shifted gears to enter into an exclusive mobile software partnership with Apple targeting enterprise iPhones and iPads. Analyst Horace Dediu called it "the most unexpected" corporate partnership and "the biggest news of 2014." And then Microsoft, long known for foisting half-baked versions of its Office apps on Apple's platforms, released its first real tablet apps exclusively for iPad, then updated its iPhone versions even as its own Windows Phone editions languished in an unusable maintenance mode. Microsoft didn't seem to care that the clickbait pundits were publishing weekly reminders about Android's "80% market share" achieved by shipping loss leader devices into channel inventory. After all, Microsoft has witnessed the shipments of millions of its Zunes, Windows Mobile/Phone and Surface devices, fully aware that no real software market ever developed for any of those platforms. It even once pushed out some apps for Nokia's formerly dominant Symbian platform, learning firsthand about the market share myth. Game developers that started 2014 demonstrating their desktop-quality 3D rendering and physics engines working for the first time on an experimental, prototype niche mobile chip from Nvidia were by WWDC in the middle of the year showing off that same software running on Apple's mass market A7 chip from 2013, using the company's newly released Metal API. In one weekend of 2014, Apple sold more Metal-capable iOS devices than all of the Tegra K1's Nvidia and its partners will ever ship in total. Game developers are as smart as Microsoft when it comes to knowing where the money is. It's hard to even imagine a greater fundamental shift occurring in single year. However, if you look at the catalysts behind these changes, it's clearly apparent that Apple didn't just make a one-time correction to the ridiculousness of 2013; everything about the company is progressing along a dramatic trajectory that will have an even bigger impact on the industry next year. A series of key technologies and initiatives that shaped Apple's spectacular 2014 were similarly planted well before the year started. The fall launch of iPhone 6--the company's biggest product launch ever--had been rumored throughout the year. Those early reports of two larger iPhone models appeared to have a smothering effect on sales of rivals' fablets, particularly apparent at Samsung, although not immediately. Like most other companies, Samsung doesn't report its actual phone sales. Samsung's executives do however wildly misrepresent their sales figures to the media, making it even harder to discern what's actually happening until the fraud catches up with reality and the company's revenues implode without much warning. In May, the Wall Street Journal was duped into reporting that Samsung "may be regaining momentum," citing an interview with J.K. Shin, "the company's co-chief executive," as indicating that "sales of its new Galaxy S5 flagship handset are outpacing the performance of its previous model by 10%." Six months later in November, the Wall Street Journal followed up with a report noting that while Samsung had initially built 20 percent more of its new flagship phone, it had actually sold 40 percent fewer in its first three months, resulting in an expensive backlog of unsold inventory. In China, the Galaxy S5 sold only half as well as its predecessor across the first six months. That truth only trickled out in the month after Samsung reported a 73.9 percent year-over-year implosion in its mobile profits during its September quarter, making it sort of the opposite of "news." In reality, there was no real surprise. Reviews of the Galaxy S5 were poor. By April 2014, it was well-known that Samsung had routinely lied about its sales figures. In May, Apple's iPhone 5s was beating the Galaxy S5 in customer satisfaction rankings by a wide margin, even within South Korea. The Wall Street Journal should have been able to connect the dots. Globally, throughout 2014 Apple had been trouncing Samsung with iPhone 5s, a relatively small phone but one equipped with a 64-bit A7 chip packing superior graphics; a functional Touch ID fingerprint sensor; a much more attractive fit and finish and the rich app ecosystem of iOS. When Apple released new iPhone 6 models, it built upon the superiority of its previous model, adding a larger screen, thinner profile and Apple Pay features. By the end of October, after just two weeks of iPhone 6 sales, analyst Ben Bajarin noted that Samsung had suffered a devastating 50 percent collapse in sales on both its Galaxy S and Note products across the entire quarter. That's an impact you might call thermonuclear. Samsung is now seeding sympathetic media sources with the idea that its next phone will be 'built from scratch' and really be amazing, but the company has another six months of sales revenues to report before it even gets there, and those sales are being smashed from above by iPhone 6, and from below by cheap Android devices from Chinese companies (and rivals like LG, which also manufacturers commodity Android phones at profit margins below 5 percent). In between, Samsung is punching itself in the gut with huge unsold inventories of Galaxy S and Note phones it must unload at fire sale prices. And as Microsoft and Amazon can attest, dumping your previous product flops on the market at clearance sale prices has a negative impact on your ability to sell the next version at full price. That should make 2015 really interesting. Apple didn't build iPhone 6 from "scratch." It incrementally built upon its eight year lineage of the world's most popular smartphone. Samsung's original Galaxy S was also not built from "scratch," but rather from an intense, focused effort to duplicate Apple's iPhone 3GS. Samsung subsequently copied Apple's iPhone 4 and iPhone 5 models, as well as iPad, iPod touch, and the other products Apple makes (from Mac minis to MacBooks). Building from "scratch" isn't even a desirable goal. It's an admission of great failure. Microsoft designed Windows Phone 7 from "scratch" because Windows Mobile 6 was garbage nobody wanted. Microsoft Surface was built from "scratch" because Windows Tablet PCs were similarly undesirable. Further, devices built from "scratch" are high risk efforts; just ask Amazon, or Palm, or BlackBerry or Nokia or any of a variety of other companies that rolled out a totally new product from "scratch" that dramatically flopped on arrival. Rather than needing to start over from "scratch," Apple has incrementally improved its offerings with long term plans that weave in home grown software and acquired technologies. Apple's pace and scale of acquisitions grew intense in 2014, with the company finally beginning to spend some of its enormous cash hoard. You can expect that to continue, particularly given the July appointment of BlackRock's Susan Wagner to Apple's board of directors. Over the past five years, Apple has been assembling a silicon design team that has decisively outpaced the industry. The company's latest A8 chip beat the Qualcomm Snapdragon, Nvidia Tegra K1, Texas Instruments OMAP, Intel Atom and Samsung Exynos in key, meaningful ways. Apple didn't start from "scratch," nor did it simply copy other's work. 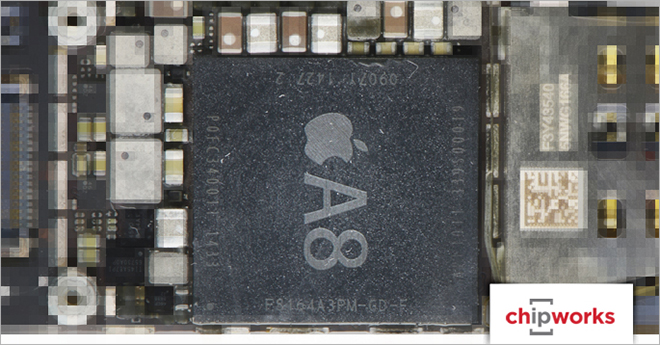 Apple's original 64-bit ARM designs were not only executed first, but incrementally woven into its mobile hardware and software platforms. In 2014, Apple further enhanced its 64-bit iOS platform with the new Metal graphics API and Swift programming language. Apple's prior acquisitions of Anobit and AuthenTec also incrementally improved the allure of iPhone 6 by enabling greater memory capacity and perfecting fingerprint scanning in preparation for Apple Pay. While Motorola delivered a fingerprint sensor and Google pushed for NFC Wallet payments years ahead of iPhone 6, both developments resulted in technology that didn't work well and that users ignored. In contrast, Apple Pay has not only proven to be instantly popular, but is also serving as a differentiating feature that a variety of stores, restaurants and banks are advertising on Apple's behalf. All of these core, proprietary technologies benefit from Apple's vast economies of scale, drilling down the company's costs while making it more expensive and difficult for competitors to steal the company's original work. Apple updated its iPhone 5c in March, continuing the very successful phone that media bizarrely spent most of 2013 ridiculing as a failure, despite having topped sales records and successfully attracted a large swath of budget minded Android switchers. Counterpoint subsequently reported that Apple's iPhone 5c and 5s represented 42 percent of global 4G LTE smartphone sales, offering a reminder that most of Apple's "competition" is not seriously competing at all. 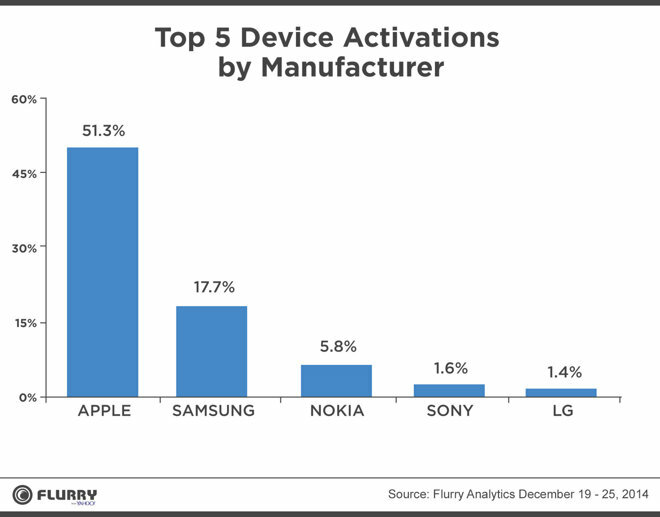 Flurry is now reporting that iOS devices models grabbed 51.3 percent of all activations over the holidays, not just among higher end 4G phones. That's simply astonishing. Apple also refreshed its MacBook Air lineup in April, delivering a new $899 base model with the lowest-ever original U.S. price for a newly released Mac notebook in the company's history. In June it also introduced a more affordable 21.5 inch iMac and moderately enhanced iPod touch lineup at reduced prices. New MacBook Pros with Retina Display sporting faster CPUs, more RAM and lower prices were introduced in July, along with a price-reduced, entry level MacBook Pro. 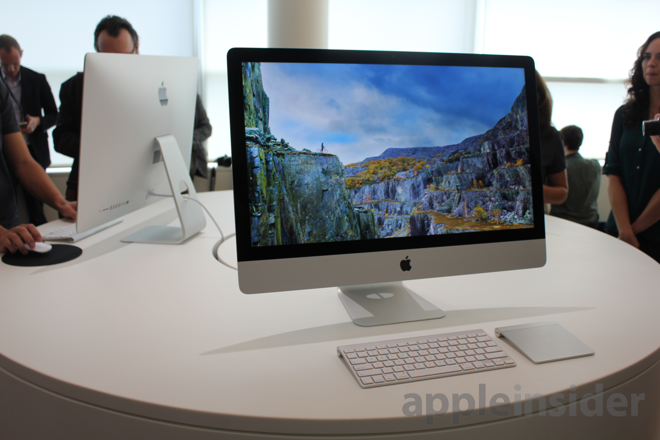 Those price reductions helped to push Mac sales to new records, reaching 4.4 million in the June quarter, followed by sales of 5.5 million in the September quarter, achieving the company's largest market share among conventional PCs since 1995. In September, Apple introduced the new iPhone 6 and 6 Plus, along with iOS 8, Apple Pay and a sneak peak at Apple Watch. In October, Apple introduced OS X 10.10 Yosemite featuring Continuity features and iCloud Drive, along with new iWork apps and iTunes 12; a less expensive new Mac mini and the new 5K Retina Display iMac, the world's first PC paired with such a high resolution display. Apple subsequently introduced the thin new A8X-powered iPad Air 2 and a refreshed iPad mini 3, both sporting Touch ID (and via their Secure Element, Apple Pay support within apps). Apple's expanding business is demanding new office and retail space. After getting final approval late last year, Apple began work on its massive new Campus 2 site in 2014, which will ultimately add 2.8 million square feet of office space, housing at least 12,000 new workers. There's a lot of work left to finish before occupancy begins in 2016, but the site is crawling with activity and rapid progress is underway, as presented in our campus tour from last week (below). That means another year or two of constrained working conditions at Apple's space-constrained Infinite Loop campus in Cupertino, California, and a number of nearby office buildings and rented spaces nearby. Apple also began building $300 million in new offices for 3,600 workers in Austin, Texas; facilities in Cambridge, England; Shanghai, China; Haifa, Israel; Orlando, Florida and planned offices in downtown Los Angeles. Apple has also been busy building data centers in Newark, California; Maiden, North Carolina; Prineville, Oregon; and Reno, Nevada, and is rumored to be planning additional iCloud sites in Curacao and the Netherlands. The company is also operating additional facilities in Elk Grove, California; Mesa, Arizona and Cork, Ireland. The company reports that it currently owns or leases 19.7 million square feet of building space worldwide, 4.9 million square feet of which is related to its retail stores. It's not just new office space that Apple's working to build; the company also has a backlog of retail stores to construct, including two dozen planned for Greater China. 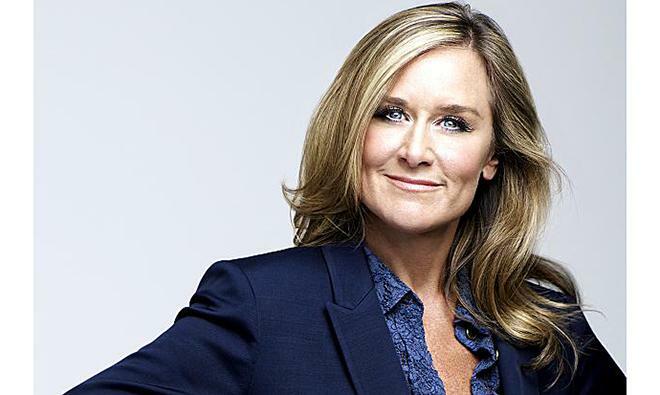 Retail efforts will increasingly gain momentum under Angela Ahrendts, the company's senior vice president of retail who joined Apple in May. By the end of Apple's fiscal 2014 ending in September, the company reported a total of 437 retail stores, 259 in the U.S. and 178 abroad, employing 46,200 people. The average revenue per store is now at $50.6 million. Over the next year, Apple stated that it plans to spend around $600 million on its retail stores, opening 25 new locations worldwide and remodeling five. Across fiscal 2014, Apple brought in revenues of $182.8 billion and earned $39.5 billion, adding to its cash pile of $155.2 billion, even before the impact of the iPhone 6 and iPad Air 2 holiday quarter is considered. This performance sets up the company with enormous potential for 2015.